Well, in the Pyrex measuring cup I discovered 3/4 cup of white AP flour, 3/4 cup whole wheat pastry flour, a tad more than 1/2 tsp cinnamon, a tad more than 1/4 tsp nutmeg, a tad more than 1/4 tsp ginger, a tad more than 1/8 tsp cloves, 3/4 tsp baking soda, and 3/4 tsp salt. 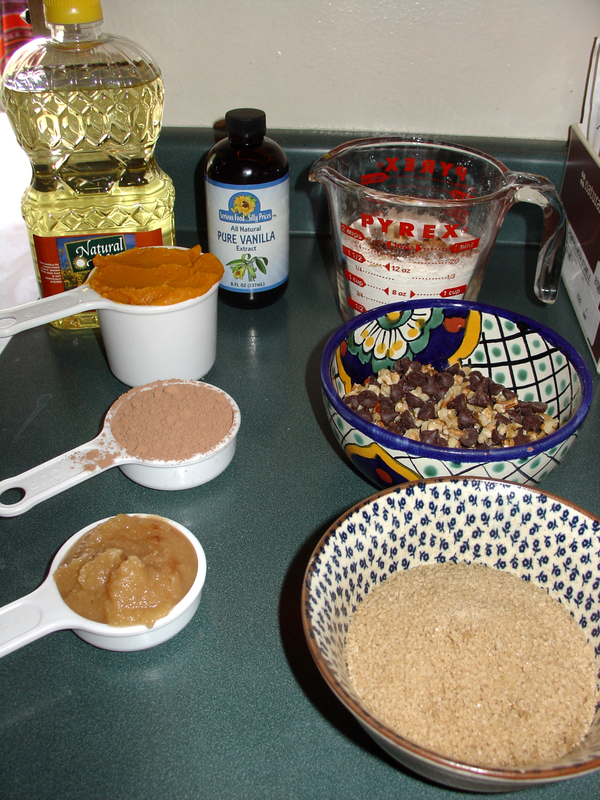 In the next bowl I found 1/2 cup of chocolate chips and 1/2 cup of chopped pecans and walnuts. In the front bowl, I found a bit more than 3/4 cup of turbinado sugar. On the left side, I saw some canola oil (and felt compelled to measure out 2 tbs of it) and some vanilla (I had an inkling that I really needed 1 tsp of that stuff). In the measuring cups I discovered 1 cup of pumpkin puree, 1/3 cup of unsweetened cocoa powder, and a little more than 1/2 cup of apple sauce. Also, out of the corner of my ear, I heard the tea kettle boiling 1/3 cup + 2 tbs of water. While the chocolate chips and nuts would have tasted good alone, as would the apple sauce, the pumpkin puree would have tasted okay (if a bit bland), and the boiling water would have been fine with a tea bag, all of the other ingredients really needed to be combined in some way. So, I took the apple sauce, the oil, and the cocoa powder and mixed them together in a large bowl. Then I added 1/3 cup of the boiling water and mixed it in with the chocolate mixture until it made a thick chocolaty paste. Next, I added the pumpkin, sugar, and vanilla and mixed everything together well. After that, I sifted in 1/2 of the flour mixed and mixed for just a few seconds, added 1 tbs of boiling water, and mixed for a few more seconds. Next, I sifted in the other half of the flour mixture, mixed for a few seconds, added another 1 tbs of boiling water, and mixed for a few more seconds until the flour had just incorporated into the batter. Then I carefully folded in the nuts and chocolate chips. I lightly greased a muffin tin, poured the batter in, and cooked it at 350 degrees for about 23 minutes. I took them out and had perfection. Look at the beautiful insides of that muffin! 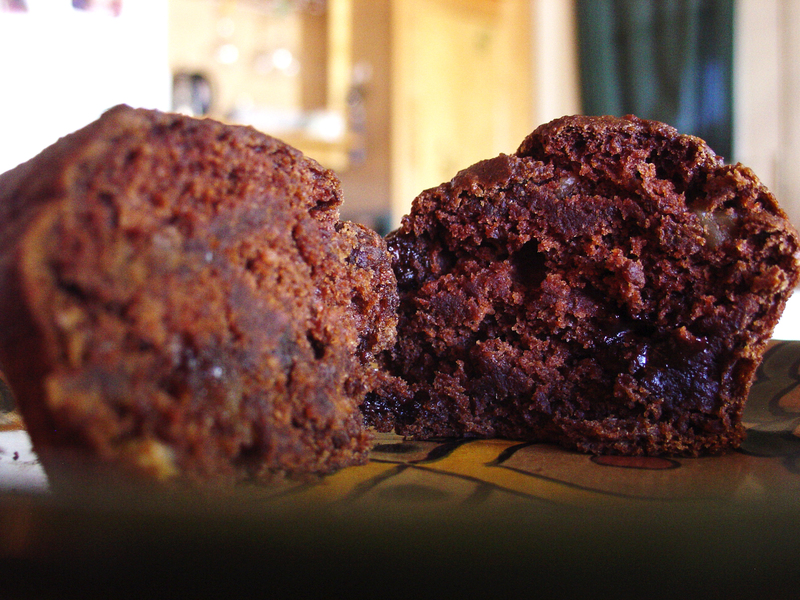 The cocoa powder and pumpkin give it a lovely brownish orange hue. The chocolate chips and nuts are distributed throughout. The incorporation of whole wheat pastry flour gives it a little more fiber. The deliciousness factor makes me eat three-at-a-time. These muffins are pretty much perfect.